Introduction Retail selling is not brain surgery - it is twice as hard! Retailing is a tough and fickle business! A great many people, often with little or no experience, think that setting up shop is a sure way to riches. Many of the same people disappear off the scene within their first year in business, most often a little wiser but much poorer. During the preparation of this book I spoke to a great many people about their impressions of retailers and their retailing experiences. Barely a single person had a positive word for their retail experiences and when it came to supermarket shopping the complaints came thick and fast with countless horror stories being the norm. My research and feedback from many interviews suggests that the retail industry in general is beset by rude, surly, abusive, aggressive and totally uncaring retail shop assistants who delight in carrying on private conversations while ‘serving’ a customer appear to be the norm. And as for attitude! Interestingly none of these people seem to be in the job very long and they obviously have no intention of making a career of retail selling. I am sure there are exceptions but they are very hard to find. Clearly their is a major gap between retail shoppers expectations and what retailers are prepared to deliver! Conversely people in the the retail industry made similar complaints about rude and aggressive customers, often prepared to haggle over already discounted prices who think nothing of damaging or marking goods on display, opening bottles on the supermarket shelf to test for ‘freshness’ and countless other examples of behaviour guaranteed to annoy retailers who have invested large sums of money in their business. A further problem raised by most retailers is having to deal with difficult landlords as well as countless other challenges on a daily basis. In today's complex and ever-changing marketplace, retailing is both an art and a science. To succeed and thrive, retailers must develop and maintain a clear-cut management focus. To build a winning retail strategy' potential retailers should formulate a strategic business and marketing plan backed by viable, practical and easy-to-implement steps that lay the foundation for long-term profitable growth. 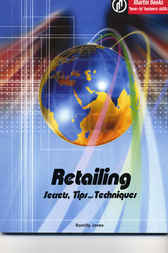 I wrote this book with the aim of assisting retailers and anybody with an interest in the retail trade of improving their performance and making retail shopping an enjoyable experience.